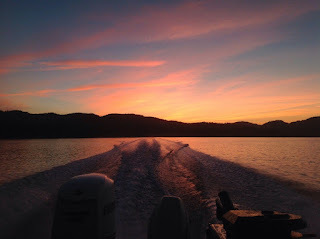 Lots of great reports from Sooke lately....nice sized chinook salmon and plenty of pink salmon action for the kids. There have been some pretty darn nice fish landed in Sooke this year already it's a darn good sign. I expect with the next wave of Chinook coming through (with the bigger floods I hope ) it will bring a few more in with them. There is always the big one down there, it's what brings me 1400km every summer in search of him. The hope and expectation and the feeling that this is the year I break 40# I have broke 30 3 times in Sooke over the last 10 years twice in one week with a 32 and a 33 just 5 years back. I cant sleep when I am there, I am lucky if I get 4 hours sleep a night. I fall a sleep about 10 pm and am awake by 2 or 3, I can see those big beauties slipping past the light house, past Otter, slipping by in the dark under cover. I can't sleep, I am up with coffee made and at my boat by 430, spot light out the front as I make my way through the crab floats in the harbour. As you make the turn around the spit and the cool west wind hits you in the face and you point the bow west you can feel, this is the day. As you drop your first bait in the water just past the rocks up tight to the bank on Otter, so dark yet you fumble with your tooth pick to see it come through the teaser head. Rods set, coffee in the cup, down rigger cables have that nice hum to them ... yup today is the day. Whump,, the right rod hammers free from the clip and the Islander screams free, your heart jumps cause you know this could be the one, this battle you are about to have, this is the one you have tried for since you were a young boy..
Ahhh just a few more sleeps !!!! That's awesome ... very well said Walleyes. Wishing you tight lines and calm seas.